‘Orphan Annie’ just arrived! 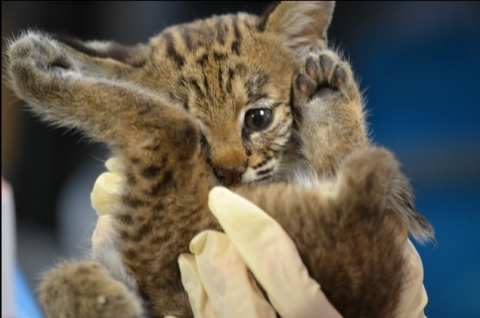 On June 22nd, we received an 8-week-old orphaned bobcat. Orphan Annie, as we have nicknamed her, was noticed wandering alone on a 40-acre privately-owned farm, on Saturday evening. She was left alone until she wandered near the citizen’s home and appeared starved, dehydrated and weak. It quickly became evident that this little girl was without her mama best task manager software. She was brought into the citizen’s home and placed in a carrier for the night. She ate and drank, and perked up some. When she arrived to BTN, she was given an exam, injectable fluids, oral dewormers and antibiotics, medication for her eye, a “sponge bath,” warm bedding and food. She has an infection in her right eye, causing minor respiratory issues. She responded well to the exam, and was growling and hissing. She will be on meds for the next week and is receiving minimal human contact. She is being kept in a secluded area so she can remain sensitive to human noises, sights and smells. We intend to find a friend for her by contacting other licensed wildlife rescues to see if another young bobcat is receiving care. We do feel that she is capable of growing up wild, even if she’s alone. We hope for a swift growth and healing process so that her time with BTN is short. We anxiously await the day that we can send her back to her wild home, a little bigger, stronger and more capable!